Fourth Sunday: 10.45am holy communion. Do come and try these exciting new services. You will be made very welcome. The Parochial Church Council supports the Vicar, Bryony Wood, who lives in Aslockton (01949 850523) and has the responsibility for the care of the church buildings and surroundings, as well as support for the minister or lay leader who take the services. Jean Smeeton (01949 850906) and Jonathan Ford are the elected Church Wardens and are available to assist with any enquiries. 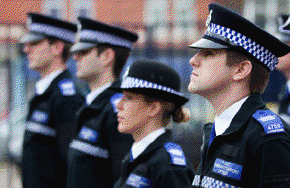 They are supported by other members of the PCC – Jonathan Ford (Treasurer), Roger Parvin (Hon Sec) Brian Gunn, Patrick Newton, Martin Seabrook, Irene Staton and Gill Smellie. A monthly newsletter is circulated to all those interested and sets out the details of the services during the coming month and other church activities. All those wishing to be included in this mailing list should contact Roger Parvin. 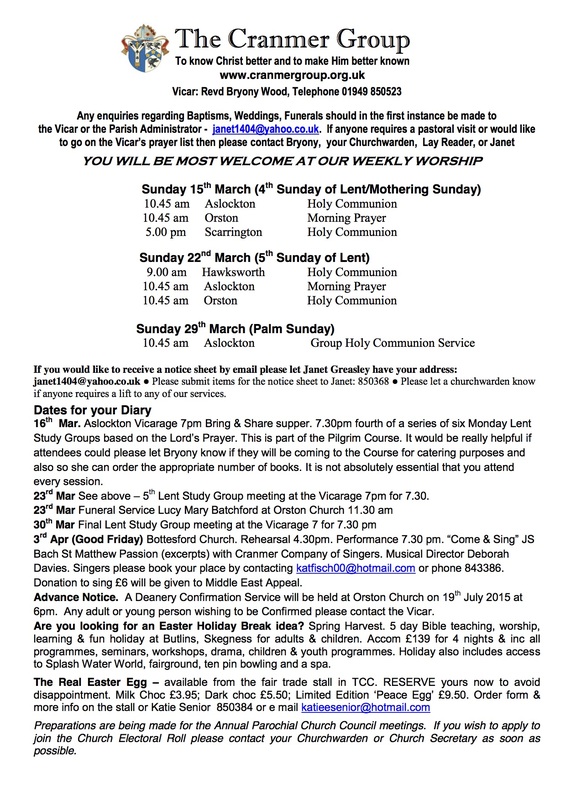 The weekly Cranmer Group newsletter can also be requested via Janet Greasley via email janet1404@yahoo.co.uk or see above to download. 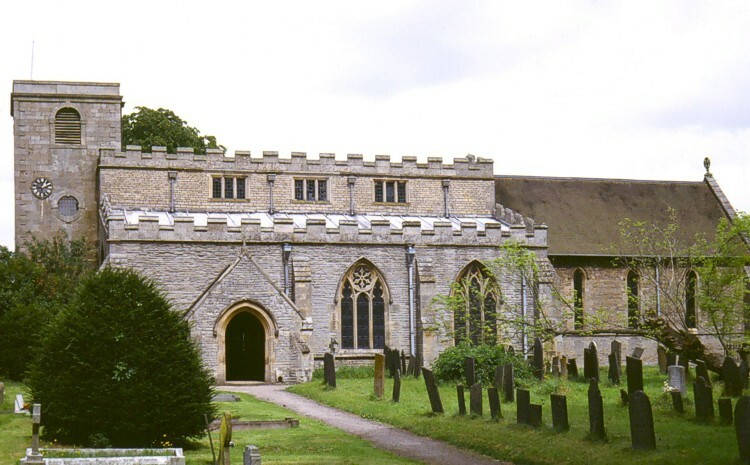 The present church building originates from the early 12th century. At that time the “church” at Orston was given to the Bishop of Lincoln who set about replacing the pre-conquest building with more imposing, permanent structure. There were probably generations of church buildings on this site long before then as they were merely log huts roofed with thatch. Many villages had them from the sixth century. These would have been built on a sacred part of the village, typically on an ancient burial mound. (Note how the churchyard is elevated like many in the area). The medieval wall painting provides a glimpse of those much harder times when peasants had to stand and there were only seats beyond the chancel screen for clergy and the lord of the manor and his family. Of course, there has been much rebuilding, alteration and extension since then. It is not surprising that the largest building in the village would be used not just for religious services. It acted as the village hall, the school and was the centre of village activities. Certain parts of the church may be attributable to its secular role. For instance, the church porch was traditionally used for the swearing of all solemn contracts, from marriages to deeds of sale. This was a time before the Cranmer Group of Parishes was formed and Orston and Thoroton shared a vicar. There was a service in each church every Sunday alternating Matins at 10:30am and Evensong at 6:30pm. The music at Orston was provided by a pipe organ, which was, hand pumped by sturdy young men with varying degrees of assiduity. It was alleged that one of these would catch up with the football results from the previous night’s Football Post whilst blowing!! The organists were Mrs Elsie Walker and her niece Kath Walker. The collections taken in church were the main source of income for the Church. This was before the days of charitable covenants and gift aid. There was an annual garden party for church funds at Orston Hall. This was then owned by the Burton family of Smithy Row. Jean Smeeton remembers wearing a new straw hat decorated with daisies in case she was chosen to present the bouquet to the lady who opened the event. The old school room (now the offices of Carlin Construction) was the meeting place for organisations such as the Mother’s Union, for Whist Drives, PCC meetings and Parish Council meetings. A tortoise stove heated the room. Choir practice was on Friday evenings in the nursery at Orston Hall. Mrs Burton made the choir boys practice the pointing for the psalms for the coming Sunday. There was a special treat afterwards, namely iced buns and lemonade from Burton’s shop. Some people thought that was the reason some of the choir boys attended.